I spent another weekend antiquing. I have sooo much fun doing that! You won’t believe what I found!!! This is a Victorian scissor frog. It is very large-measuring about 6 inches across. It didn’t come with the base, so I found a silver decorative base that I think goes beautifully with it, and it is a perfect fit. I am not going to polish them, I think they look wonderful with their age showing. For right now I think that this scissor frog will just be a shop model. I don’t think I could part with it yet. It seems to be quite a rare frog, I must enjoy it for a while. I think we will have to have an auction for it when it is time to sell. There is already interest in it. These other two are just sweet. The clear class is a pressed glass with a frog inside and the pink pitcher I just couldn’t pass up. Pink glass is my favorite. I thought this would hold various stitchery tool well. Market is coming up February 17-19 and after market we should she some really wonderful new designs coming into the shop! We all love Blackbird and guess what…. It will be a wonderful book FULL of the designs that they taught in classes and at retreats in the last year. 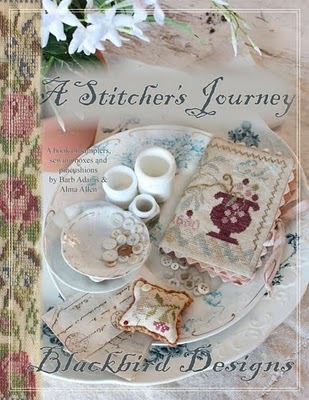 Included in the book are some wonderful designs that are reproduced from an antique stitching exercise book, along with the wonderful story of the young girl who stitched them. Blackbird always does a wonderful job with there books, in designing and photographing. I want to stitch everyone of them! If you would like to have your name put on a book to be held give us a call right away. The list has already been started! Everything has to be glittered for Valentines doesn’t it? For the edges I used my favorite edge punch by Martha Stewart. Each of the cards have soft strawberry marshmallow hearts inside. I think I ate more of them then I used for my valentines. I think the group will enjoy these…. Comments Off on Toni is amazing! We have a very talented customer who comes in to see us when she is in town. Today she brought in her latest work of art – silk ribbon embroidery. She is always working on something wonderful! I wanted to show you her work…. The fuchsia is very, very three dimensional. I didn’t post the picture that I took of the square with the snail. It didn’t turn out very clear. He has a real shell on his back! The delphinium is my favorite! She took a class in California, and the designer kitted everything for it. The designer is Di Van Niekerk and she has a web site if you would like to see her work. It is http://www.dicraft.co.za/ she is in Cape Town South Africa. The oranges on this tree are beads covered in ribbon with a tiny bead for the green tip. Hope you enjoyed the pictures….. Comments Off on A few more frogs…. We just can’t keep these in stock! I am lucky to be able to find a few beauties now and then. These are my latest finds. This pressed glass sugar and creamer set is perfect as a scissor frog, and a creamer catch all for your other tools. As you well know, they will only be here for a short time. This one is already gone! I think it was at the shop only one hour!